Match and meet in real life! Tonight is now available everywhere! 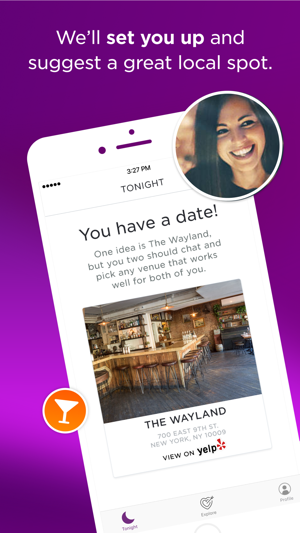 Tonight eliminates endless texting and sends you and your matches on actual dates right away instead. Simply sign up for a date by 6 pm, browse and like profiles, and Tonight will set up a date as soon as you match! 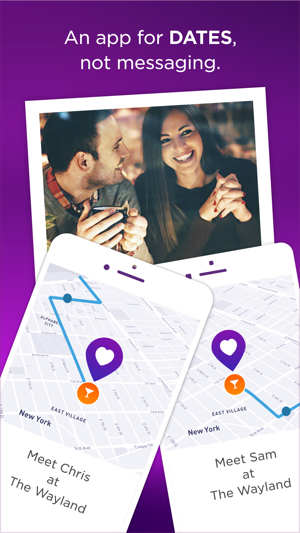 The app even suggests a great local bar or cafe conveniently located for the two of you to meet. 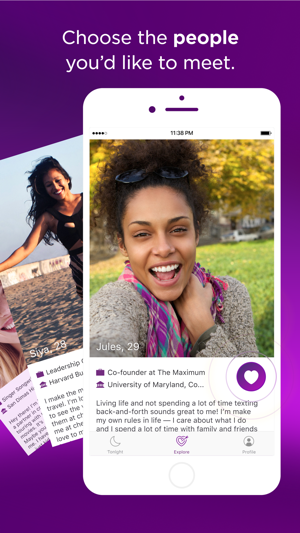 Forget the endless swiping, messaging, and waiting for replies typical of other dating apps. On Tonight, you can be out getting to know someone IRL in a matter of minutes. Maybe it's just a drink, maybe it's two.... maybe sparks fly! Maybe you'll even take an awesome trip together one day :). The possibility for magic begins the moment two pairs of eyes meet. Fall in love with a person, not a profile! 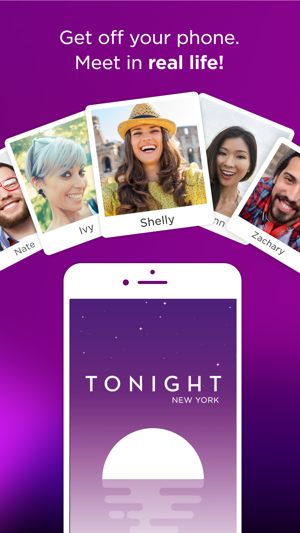 Download the app and meet someone amazing - tonight! Tonight sets up dates for you based on when you're free and whom you like. 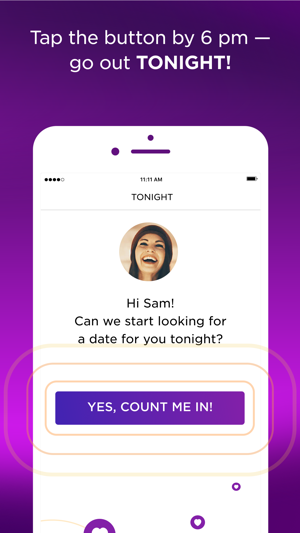 Forget the endless swiping, texting, and waiting for replies on other dating apps. On Tonight, simply sign up for a date by 6 pm, browse and like people's profiles, and we'll set up a date as soon as you match. We'll put you in touch with your date and suggest a great local bar or cafe conveniently located for the two of you. Tonight is the easiest, smartest, most efficient and immediate way to meet new people. On top of that, it's fun! When you remove all the buildup of texting back-and-forth before an online date, dating is so much more enjoyable. Show up to your date open-minded, without expectations. Grab a quick drink or coffee with this new person. Maybe it's just a drink, maybe it's two.... maybe sparks fly! Regardless of what happens, it's no big deal. The possibility for magic begins the moment two pairs of eyes meet. We fall in love with people, not profiles. On Tonight, you do your vetting quickly, and then you go see if there's chemistry in real life. Because that's where all the good stuff happens! Learn more about us at http://thetonightapp.com. Download Tonight and get set up on dates for free! However, we also offer an optional subscription package (Tonight Membership) that lets you connect with your Matches immediately. ...and go on a date! Tonight is genius in its simplicity. I've tried a lot of dating apps and I can attest to how much work goes into coming up with original, charming, personalized things to say in what essentially is a "numbers game" --- you're basically looking at a second job's worth of work. Tonight makes all the headache go away and takes you right to the good part. Setting up my profile was easy and even enjoyable---the guided questions were fun! Now I just need to fly to New York (or wait for Tonight! San Francisco). Give it a try! I am loving this new app! I was so tired of spending hours texting and half the time getting ghosted. That doesn't happen here, it's just super simple and easy – you actually get dates set up right away with your matches. Wish this had been around sooner! Would be great if there were any people in the app. Or you could change the parameters to find people. I live away from town, need to go further than 25 miles to find things to do or people to do things with. Why not open the mileage up to 100 miles? As it is this was nothing but a waste of money. Sure hope by deleting my account it doesn’t continue to charge me every month. Thanks for giving Tonight a try! Since the app is designed to set up same-day dates, we constrain the distance parameters such that people would likely be able to meet up in a relatively spontaneous way. Unfortunately this may not work well for people out of town or in areas that haven't picked up traction yet. If you opted for the premium monthly subscription and would like to cancel it, please note that you may do so directly through Apple: https://support.apple.com/en-us/HT202039. Thanks again for giving our new app a try!